During a storm – particularly a rainstorm, eavestroughs and gutters help protect your windows, doors, and walls by collecting the runoff from the roof and depositing it elsewhere. However, this does mean that cleaning the eavestroughs – and getting rid of the leaves, mud, and water that has collected there – can be a daunting and a tedious task. Though it is recommended that professional services be called to clean your eavestroughs, it is possible to clean them on your own – with proper safety measures. The first step is to clean all the leaves and fallen debris from off the eavestrough –this way you make sure that the pipes remain clean, and that nothing gets blocked in those pipes, resulting in rainwater filling the gutters and overflowing – which is never a desirable situation. To clean the leaves off the gutter, place a firm ladder on a level base – a tall stepladder would be preferable, and simply pick the leaves off. Make sure that while cleaning the gutter, you don’t lean over the edge too far – maintain your balance while on the ladder at all times. It is recommended not to stand on the uppermost rungs – and to clean the gutter on a sunny, dry, day – and never in wet or icy conditions so that you won’t slip and fall. While cleaning your eavestroughs and gutters, it is recommended that you wear thick safety gloves – most eavestroughs have sharp edges or screw points sticking out – and wearing safety gloves and goggles is always recommended. In some situations, it is recommended that you keep a bucket lying on the floor below, to help you clear up the extra debris and collect it in one place. Another thing to do is blast out the gutter with a hose, using a high pressure nozzle – to wash out the end of each length of gutter, thereby clearing all the mud off of the gutter in one fell swoop. However, this can result in mud splattering the walls of your home, so it is recommended that you carry a stiff scrub brush as well, to clear the mud off your walls. Alternatively, a leaf blower can be used for cleaning gutters – however, there are certain drawbacks – which are that the dirt may be solidified and will not blow away. In this situation, it is recommended to call a professional. One final tip is to make sure that the ladder you’re on is on a secure, level base – and that the ladder is secured, to make sure you don’t slip and fall. Century Aluminum Services makes sure that your gutters and eavestroughs remain clean – and that adequate safety measures are formed, so that the job is done efficiently, with no damaging side effects or consequences. The services provided by Century Aluminum makes sure that the servicemen that are sent to your home are honest, dependable, and reliable, making sure that everyone leaves the situation satisfied by the job done. The best part is that these services are provided at competitive market rates – thereby ensuring complete customer satisfaction. It is easy to not to assume responsibility when a small hole appears in an eaves trough. People tend to leave small issues and only attend to them after they become a big issue. You should never overlook a small hole immediately it appears on your eavestrough because it can lead to more damages. When a leak forms in the eaves trough, it causes fascia boards to rot which if left unattended may lead to a leakage in your house during a downpour. You should do a regular maintenance check on your eavestrough every autumn in preparation for the winter weather. An eavestrough helps to channel water from the roof to a drainage system during rainy seasons. It also drains excess water during winter as ice thaws. Leaves and debris tend to accumulate in the eavestrough and if not properly cleaned out, this can cause blockages. If water is not drained out properly, it tends to cause damage to the eavestrough and with time, it forms small holes. Maintenance of an eaves trough is usually cheaper compared to repairing it and saves you hundreds of dollars that may come from damage caused by leakages. The following steps will help you to maintain and repair your eaves trough when damaged. It may come as a surprise, but the number one reason why eavesthrough cause problems is because of incorrect or faulty installation. It takes a precise skill to mount eavesthrough, a talent not even contractors always have. Companies specializing in eavestrough in Toronto urge their clients to pay more attention to their rain gutters. If a problem is detected they should call them, as their team of experts has the necessary skills and equipment to inspect, clean, repair or replace broken pieces. It may be surprising, but firms advertising services for eavestrough in Toronto have many different customers. These companies are frequently called to maintain the eavestrough of the buildings supervised by property management companies, insurance companies, and real estate agents. Quite often, they also receive requests for inspections of residential complexes, as well as private property. Masters in their trade, eavestroughing specialists can fix problems that laymen cannot. For instance, many people believe that there is no solution to fix leaking corners. That is not so. Just ask any expert repairing eavestrough in Toronto, and you will be told that this problem can easily be repaired. The eavestrougher starts by completing an inspection, because solutions will vary depending on what the problem is. Sometimes a simple realignment of the pieces or adding a downspout is all that is required to get the water flowing again. Eavestroughs have to be protected and cleaned regularly. If they are not, water can build up. This can be devastating when ice builds up. Once the liquid thaws and flows under your shingles, the damages can be catastrophic. So, why take a chance? Calling an eavestrough specialist occasionally will not only prevent a lot of stress; it will also save you money! While steel and aluminum eavestroughs have a lifetime of up to 30 years, if neglected, they fast deteriorate. So the number of years your eavestroughs will last depends on how well you care for and maintain them. Eavestroughs maintenance does require climbing up to the roofline of your building using a ladder. For homeowners that aren’t afraid of height, eavestroughs cleaning is not a particularly challenging undertaking. Thoroughly cleaning out dirt, debris, etc, and making certain rain water flows through your eavestroughs need only be done twice a year. If during your evaluation you encounter maintenance problems such as leaky joints, holes and rust, then here are several tips that might help you resolve them yourself. The thought of clogged, aging or warped gutters in Toronto often makes homeowners quite frustrated, especially when they are deluged with water whenever they walk underneath the eaves. Generally, there are four common problems with the gutters which you might be well aware of. Here is a brief guide on each of these problems and how you can tackle them. If you can climb on your house roof, you may feel that you can fix the gutter problems at your own. The problem may look quite easy at the beginning but do not forget to read some do-it-yourself activity tips before you begin to sort out the problem. If you have never fixed such type of problems before, it is quite better if you seek professional help in this regard. Otherwise, you will be bringing more trouble along your way. When it comes to dealing with leaky gutter joints, many people try to fix them on their own. The process is pretty simple. All you need to do is have to a tube of gutter sealant. However, you can only repair the joints when the weather is dry. Simply apply a small amount of gutter sealant to the inside of the gutter. Let the sealant cure it for almost twenty four hours. In case the hole is big or you feel that the gutter has rusted through, you will have to purchase a patch kit from a nearby hardware store. The patch kits usually come with a screen that can easily fill the hole. Otherwise you may have to create your own patch from a metal flashing remnant. The entire process will look to be easy for those who are DIY enthusiasts. For others, this may seem to be a highly technical type of work and therefore they will usually hire professional help for this. This is an inevitable problem that all homeowners experience. Over the period of time the hangers and hardware age and weather. Under such a situation, gutters tend to pull away from the house and sometimes become bogged down due to heavy debris. In order to get this done yourself, you will have to install new gutter hangers and of course fasteners on warped or sagging sections. Hangers are quite inexpensive therefore will not cost you a fortune. Furthermore, the installation process is quite simple. You would also have to see whether the warped gutter is seated properly or not. In case it is not, you might have to replace some small sections of the gutter itself. It is a quite technical process and usually it is recommended to hire a professional person in this regard. There are some cases when a roofing contractor is also hired if seamless gutters are installed as they cannot be replaced by sections. This problem usually occurs when gutters are pitched improperly or are hastily installed. You can easily check whether your gutters are properly installed or not. Simply go to your roof and see whether they are pitched downward. The gutters need to be pitched at least quarter inch for every ten feet of gutter length. In order to adjust the gutter pitch, you will have to either re-hang the affected sections or bend the hangers a little so that the water flow is accommodated. In case you have seamless gutters in your home, then they cannot be adjusted easily. You will have to seek professional assistance in this regard and get the matter sorted out. However, you will have to ensure that you are hiring a reputable one for this project. There is no harm in doing a little survey and discussing costs and repair strategies with different experts. After a detail discussion, you will be in a better position to make a right decision. 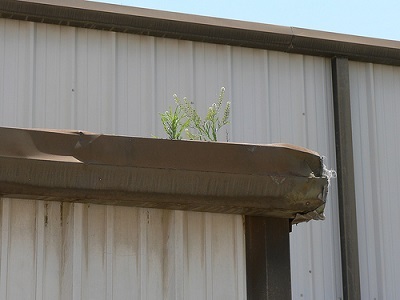 Rocks, dirt and plant matter happen to be the main reasons for gutter clogging. They prevent rain water to ruff off flow freely. If you keep on ignoring this problem, the debris will turn into sludge which will later weather the gutters and lead to eventual breakdown. There are times when this issue makes the gutters to weigh down and pull it away from the fascia. The clogging issue can easily be sorted out if you inspect your gutters thoroughly on regular basis. It does not matter whether you have metal gutters or vinyl gutters. They need your attention. You must remove the clogged areas by simply removing debris with a work glove. To improve the flow, you can clean the gutters with a garden hose. For long term protection, you may have to invest in gutter leaf guards.